Simple Saturday- a link up | House Unseen. Life Unscripted. This week she is busy talking about other wonderful things that maybe aren't so simple, so she asked me if I would host and I was all "Simple? Finally, something my mush brain can handle!" Wow, I have already talked way too much. Maybe she should change the link-up name to Ramble Incessantly So that People just Scroll Past Everything you're Saying Just to get to the Image(s). Super catchy. these black raspberries grow wild in our woods every summer. deeeelish. she could totally walk if she would just agree that she can walk. someday I will conquer the water droplet photo. mark my words! bbbbbad, bbbbbad, bbbbad....baaaaaaaaaaaaad to the bone! Beautiful pictures! God bless you! Nuthin' says "Bad to the Bone" like a pink tea cup. Well played, Darlin', well played. Look at Miss Mary all walking and stuff! I can't believe how big she is. Ooh I made delicious black raspberry jam from our b. raspberry bush! It goes great on chocolate guinness cake! I love your photos!! I would love to link up, but the only thing I've seen around here are 5 boys scratching mosquito bites non-stop, and that just aint photo-worthy!! Maybe next time! I love me a good link up, ya know. 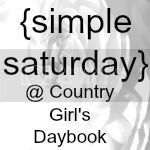 Hope to post later because Saturday really should just be kept simple. Love this idea! :) Great photos, Dwija! haha, my DS is about one year old and would definitively walk by himself - if he could agree he can. he keeps cruising along furniture, and across spaces that end onto furniture. Why is he still holding? i don`t know. My nephew started walking holding to... his own shirt! "she could totally walk if she would just agree that she can walk." Uh, yes. That was my baby girl until she was past 14 mos old. She was perfect when walking holding onto someone's hands since 8 or 9 mos, but refused to let go to do it herself and would sit down and cry if we extricated our fingers from her crazy monkey grasp. I swear, she practiced in secret so that no one would make fun of her, because one day she just started almost running around. Go figure. I have a theory she's doing the same thing with speaking and will go from nonsense babble to full sentences overnight. Why do so many 12-month-olds refuse to agree to walk? Mine made me lug him through 3 months of being extremely pregnant and then having a newborn before he started at 13.5 mos. I know I am not the only one sorry to see you go. You had some original thoughts and did a great job. Good luck!